The Zoom outdoor flag collection offers several base options, this is the cross base option for indoor or outdoor use. 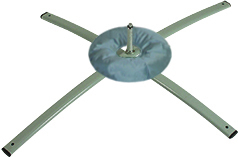 We recommend the cross base be used in conjunction with the inexpensive Orbus water ring base support for added stability. The Zoom cross base is also warrantied for 1 year and can be used all trade show season! The Wind Dancer Carrying Bag set will protect your investment and keep all your banners and flags together! Maximize this unit's portability with a high quality carrying bag!